Ben Nelson was recruited from Sturt. The wearer of the #15, Nelson first came across to the Blues from the forming Port Power, joined by single-gamer Andrew Balkwill in a trade for Blue forward pocket Brent Heaver. Nelson looked impressive enough, the guy was a ball of muscle, had good pace and could kick it a mile. Tried mainly as a half back flanker or tagger, Nelson was solid but to be fair, at times, loose as a defender. His natural attributes kept him in or around the Carlton seniors for a number of years, playing a total of 40 games. He played just the one game in 1997 (in light Blue), while Glandular Fever and hamstring problems would restrict him to just 7 games in 1998. A knee injury would delay his start to 1999 but he would go on to play every game from Round 6 onward, including the Grand Final. 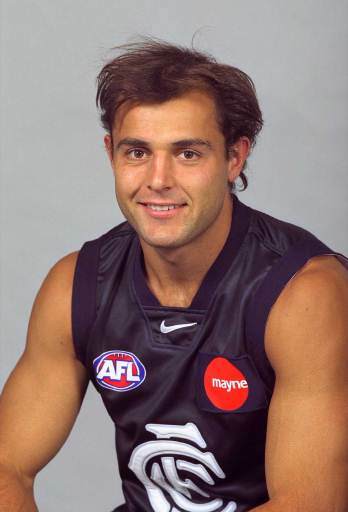 After playing 7 of the first 9 games of 2000, he would fail to gain further senior selection that year and only manage 4 games in 2001- all but one as a late replacement - before being traded to Adelaide (who he had played his first and last game for Carlton against) at the end of 2001 for David Gallagher. He went on to play another 12 games for the Crows in 2002, bringing him to a creditable 52 AFL games in total. In 2007, at 30 years of age, Nelson came equal second in SA's Magarey Medal, behind North Adelaide's James Allan. Nelson would be equal second with two other Sturt representatives, Brant Chambers and Luke Crane. In basketball such a player would be called a tweener and as such Ben Nelson was unable to acquire a regular ‘spot’ during his time with Carlton. Built like a rock Nelson was often excluded from weight work to prevent him from getting physically bigger as his motor already strained carrying such defined bulk about the field. A fine clubman Ben Nelson always placed team success ahead of his own gain. After leaving Carlton Nelson has enjoyed a fine career in the SANFL where his experience and leadership have been coveted by his team. Contributors to this page: molsey , Bombasheldon , pblue , Jarusa , WillowBlue , BlueWorld , true_blue24 and admin . Page last modified on Friday 03 of January, 2014 14:13:20 AEDT by molsey.